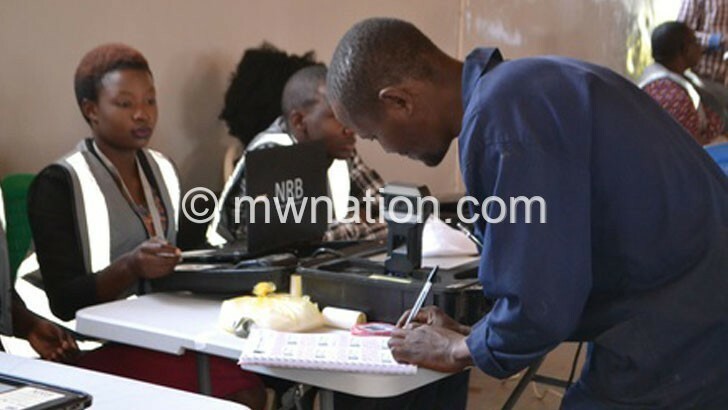 Malawi Electoral Commission (MEC) has appealed to registered voters to verify their details in the voters’ roll as the third phase of the voter verification exercise starts today. The third phase of the exercise will cover Mangochi , Balaka , Machinga , Zomba , Chiradzulu, Mulanje, Phalombe, Thyolo and Luchenza Municipality and is expected to end on December 30. In a statement yesterday, MEC chief elections officer Sam Alfandika also encouraged registrants to visit the centres where they had registered. He urged political party leaders to mobilise their supporters to go and verify their details in large numbers before the exercise closes so that they take part in the May 21 2019 Tripartite Elections. In the course of the exercise, MEC has also partnered with t h e National Registration Bureau ( NRB ) to distribute national identity cards (IDs) f o r those t h a t had registered when they were registering during the voter registration exercise. At the close of the second phase, MEC complained of a serious challenge of shortage of vehicles that affected their operations. For example in Neno, a tractor was used to ferry staff to hard-to-reach areas. However ,MEC director of media and public relations Sangwani Mwafulirwa said in an interview the electoral body engaged government to ensure that the third phase does not face similar hitches. He said there was a task force from the Office of the President and Cabinet (OPC), Plant and Vehicle Hire Engineering Services (PVHES) and MEC that was assigned to address the matter. Alfandika indicated that MEC required 388 vehicles, but government only provided 165 where some were withdrawn by councils and ministries for numerous reasons. To simplify the verification process, registrants can also check the correctness of their registration details by dialing toll-free *2019# on TNM and Airtel networks and follow instructions.